Unfortunately, the common, pleasurable summer pastime of collecting lightningbugs all too often fails to elicit the most rudimentary of questions about firefly biology. For example, where do lightningbugs come from? Where are they the other 11 months of the year? What do they eat? How do they make a "cool" light? What is the light for? And, how come no one sings "Glow Little Glow–worm, Glimmer, Glimmer" anymore? Lightningbugs are beetles in a specific family of beetles called the Lampyridae. There are 170 species of fireflies in the U.S. and Canada, mostly in the East and South. Common fireflies in Iowa are 1/2 to 3/4 inch long. The body is elongate. The thorax is cream or red with black markings and the wings are gray-black with a faint stripe down the middle and at each edge. Of course, the usual identifying characteristic is the light-emitting organ on the underside of the last 2 or 3 abdominal segments. Like all beetles, the fireflies have a complete life cycle consisting of four stages: egg, larva, pupa and adult. The adult females lay their eggs in mid–summer. Egg hatch occurs by late summer and the larvae are present until the following spring. Pupation occurs just before the adults are seen flying about in June and July. Lightningbug larvae are usually found in moist areas such as under the loose bark of dead trees, under mulch and debris and within moist, loose soil. The worm–like larvae have six legs and in general appearance resemble ground beetle larvae. The underside of the lightningbug larva is round and creamy white. The top is brown and flattened with the segments expanded into shield–like plates that protrude slightly to the sides and to the back, overlapping the next segment. The full-grown length of the larvae is about 3/4 inch. The larvae possess light organs similar to those of the adults, and their luminescence often attracts the attention of gardeners. Lightningbug larvae are predacious and feed on small insects, snails and slugs. 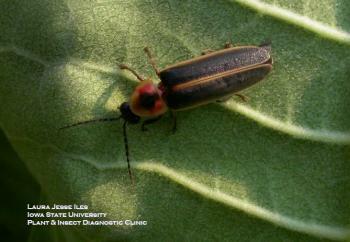 Lightningbug larvae and adults produce light by an interesting reaction of chemicals and enzymes. The light produced is a "cold" light; that is, the chemical reaction produces nearly all light and very little heat. The light flashing is regulated according to a genetically fixed pattern and is used by the adults for courtship. It is one of the means by which the males and females recognize members of their own species. Each species has a distinctive pattern of flashes, varying in flash number, duration, interval between flashes, motion accomplished during the flash, height of the flash above ground and so forth. The males and females recognize their own species' flash and get together as a result of the illumination. And finally, what are glow–worms? Entomologists may use that term for another specific family of beetles that has strongly luminescent larvae, but I assume the general public sings of lightningbug larvae and lightningbug females. Although the females of many species have typical, beetle–like wings, in a few species the females have short wings or none at all and look like larvae. These non-flying females live in the grass and flash their response to males flying overhead. The term glow–worm accurately applies to both the larvae and these females.